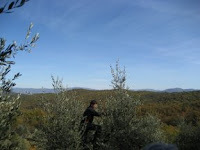 After a brief safety lesson (wearing goggles are a must), we headed for the olive grove at Casa Loretino. The group set up nets underneath the trees and then used tools to rake down the olives, of all sizes and colors, light green and dark purple. We even climbed up the trees to reach the higher branches. (Some of us stuck with the lower hanging fruit.) We managed to collect quite a few crates full of olives, which is measured in kilis and quintere. A good time had by all. Buono sera!